An areolar groove is an adaxial extension of the areole on the upper side of the tubercle (from its base to its apex) found in several genera of cacti. In some species nectary glands occur in the groove of most tubercles and may occur at any position along an areole groove. The glands initiate by the areole meristem in the same manner as spine, with which they are homologous. A. fissuratus and kotschoubeyanus has monomorphic areoles with both floriferous and spiniferous areolar areas developing within the same meristem and never splitting off. 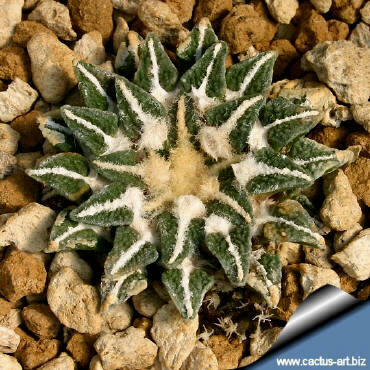 A. retusus and A. agavoides, on the other hand, has areole dimorphism with the original single growing point becoming elongated and then dividing into two portions. However, A. trigonus, differs from both the above groups as the spiniferous growing point never develops from the original meristem. All species begin with an original meristematic area, with differentiation occurring during elongation and maturation of the tubercle. It is believed that this species have areolar meristematic areas with potential floral and spiniferous areas, but that growth and maturation can occur in one of three places in relation to them.